Starting on 14 October, the community of The Robert H. N. Ho Family Foundation Centre for Buddhist Studies at the University of Toronto will sit down together to enjoy a cup of tea. However, this will be no ordinary tea party, but the first of three public-facing events in the center’s “Tea + Buddhism: A Workshop Series” focusing on the intersection of tea, culture, and Buddhism in three distinct geographies: the Himalayas, China, and Japan. This series of experiential learning events is just one aspect of the activities of the Centre for Buddhist Studies, which was founded a little over a year ago with a mission to “support a deeper understanding of the diversity of Buddhist traditions around the world.” The center was officially launched in August this year at the 18th International Association of Buddhist Studies (IABS) Congress,* which it hosted, sponsored by The Robert H. N. Ho Family Foundation. With innovative and inclusive programming, outreach, and support for Buddhism in the university and beyond, one could say that the center’s activities closely align with the vision of its founders of building a framework to create and foster a worldwide community of Buddhist scholars. Also deepening Annie’s scholarship was a study trip to Thailand, where she was able to immerse herself in traditional weaving practices through a program with the International Institute for Asian Studies. The experience aligns with part of Dr. Garrett’s pedagogy of “learning with the body.” This fall, Dr. Garrett is teaching a class that explores how historical, cultural, and spatial contexts shape practices of walking called “On Foot: Cultural Histories of Walking.” One can easily see the influences of such richly immersive practices embodied in and through the center’s programming, in its experimental learning approach, and in the opportunities that students are inspired and encouraged to pursue. This creative approach was also recently evidenced in a Buddhist Studies symposium sponsored by The Robert H. N. Ho Family Foundation and organized by the American Council of Learned Societies (ACLS) in cooperation with The Robert H. N. Ho Family Foundation Centre for Buddhist Studies at the University of Toronto and the 18th IABS Congress. Envisaged as a celebration of Fellows of The Robert H. N. Ho Family Foundation Program in Buddhist Studies, the symposium provided an opportunity for Fellows to meet their cohorts, share their research, and receive valuable critiques and feedback from senior scholars in the field. Chaired by Dr. Andrzej Tymowski and Dr. Steven Wheatley of the ACLS, as well as Dr. Stephen F. Teiser of Princeton University and Dr. Donald Lopez of the University of Michigan, the Ho Foundation Fellows, recipients of an award open to international scholars, were offered an intimate, supportive environment in which to share and discuss their work—another way in which the Ho Foundation’s mission of creating a supportive network has manifested. Dr. Tymowski, who has a long and distinguished reputation for promoting scholarship, offered this insight: “The overall mission is to make this an international community of scholars who work together for each other and think of themselves as working in a field and working on a common enterprise.” This community-creating event takes place every year, with Ho Foundation Fellows and senior scholars continuing and building upon their relationships with the Ho Foundation and each other beyond the symposium. 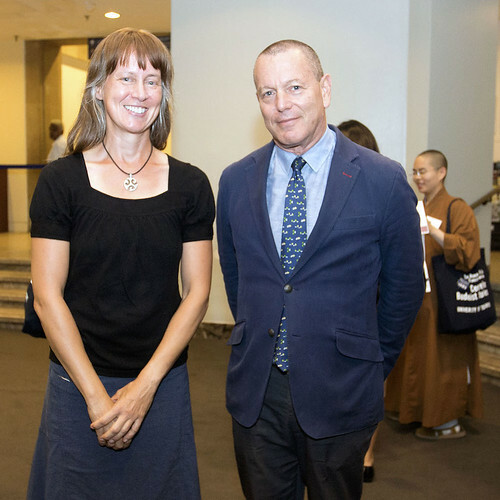 The Centre for Buddhist Studies and the ACLS also jointly sponsored a roundtable at the Royal Ontario Museum during the recent 18th IABS Congress. Open to the public and hosted by ACLS president Dr. Pauline Yu, the roundtable sought to investigate ways to bridge divides in Buddhist Studies. Three scholars were invited to “reflect on the degree to which their own specialties have become barriers to bridging divisions,” exploring the postulate that, like the tradition it investigates, the field of Buddhist Studies has shown a tendency to subdivide. Speakers included esteemed scholars such as Dr. James Benn from McMaster University, Dr. Amanda Goodman from the University of Toronto, and Dr. Juhyung Rhi from Seoul National University. Such strategic programming, hosting, and promoting of Buddhism and Buddhist Studies at the university and beyond are the result of the expansive vision of Mr. Ho and his family. One can clearly see the lasting and sustainable impact being fostered at the center through its holistic approach and program of workshops, film series, and collaborations across the university and with communities locally and internationally. By inviting scholars and the public to engage in a sensory experience of various cultures sharing a common thread of the history of tea drinking, different strands of Buddhist thought and cultural practices are also imbibed and discussed. This unique workshop seeks to provide participants with a diverse yet unifying view of different Buddhist practices that, at their core, are all rooted in the teachings of the Buddhadharma. We hope that the center can serve as a model for the future of Buddhist Studies in a university context that seeks to learn, to educate, and to share its resources. What is Attained through Amitabha-Recitation?